The Eclipse-based Remain Software software change management tool TD/OMS has been seamlessly integrated with IBM RDi for a long time and now the solution is ready for the latest version of the development environment from the Big Blue. The easy to use installer will automatically configure any version 9 of Rational Developer for i, including the latest version. After this installation, all the TD/OMS functions are available from within the RDi interface. The TD/OMS integration delivers one uniform interface for Task Management, Check-out, Edit, Source Compare, Compilation and Problem Resolution which results in a significant increase in development productivity. 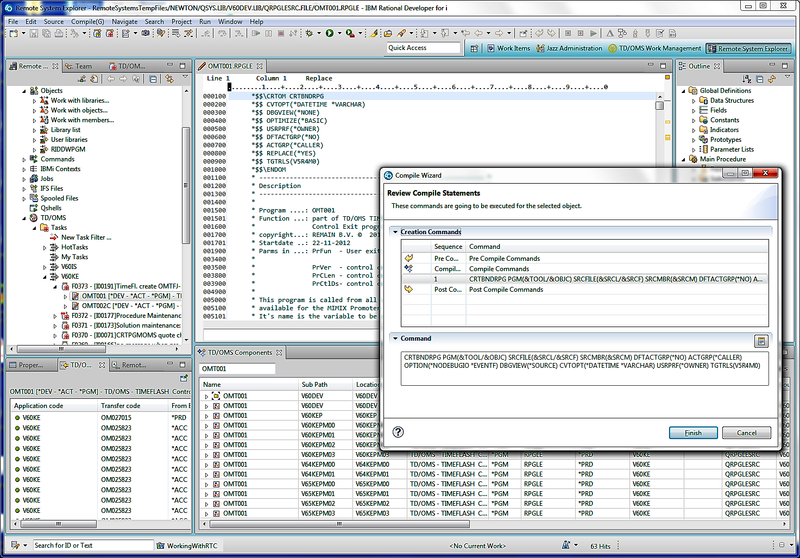 Besides the availability for the TD/OMS perspective and all its related views from within RDi, the RDi RSE view will be enhanced with a TD/OMS node. Developers using both tools will greatly benefit from the streamlined development process, higher productivity rate and more stable and secure change management process, resulting in improved quality of applications. TD/OMS is an IBM i Application Lifecycle Management solution supporting change, development, modernization and multi platform deployment processes. This modular solution gives complete control over the software life cycle process and provides a real time overview of software components and configuration. Compliance and auditing requirements can be easily met due to the registration of all component movements.